The AW Chain continues into round two. Forbidden Snowflake wrote a post about ghosts and mentioned an experience of a slightly paranormal kind. Speaking of ghosts, whether we believe in them spirits or not, who doesn’t enjoy a spell-binding ghost story told on a rainy night? And one has to give credit to the writers who make our hearts race and our pulse soar with such chilling tales. 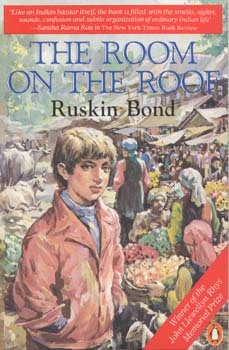 One such Indian author is Ruskin Bond. However, he is not just a ghost story writer. Rather, this versatile wordsmith has also penned some ghost stories, along with novels, short stories, travelogues, and poetry. A writer of Anglo-Indian descent, Bond is the quintessential Indian writer in English and a lifelong lover of India. Born in pre-independence India, he has lived through more than seventy autumns. The love of books and writing started early for him, thanks to his father, himself a bibliophile. Young Ruskin or Rusty as he was called, found encouragement from his father to scribble along in a small note book. Bond senior would often take Ruskin on nature trails, and wild flowers, trees, birds and other nature’s wonders became a permanent part of Bond junior’s psyche. These elements would become inseparable from his writing, too. In 1944, as the Second World War still raged on, Ruskin’s father passed away, succumbing, not to the war, but to malaria. Rusty, along with his siblings and mother, had to move to England. During the four years he was there, a terrible homesickness for India overtook him. Yet, there wasn’t any feasible means of crossing the sea once more. Young Ruskin continued writing, though. He was seventeen when The Room on the Roof, his first novel came out. The book won the John Llewellyn Rhys Prize. The book’s advance, 50 pounds, helped him buy a ticket to return to India—his home forever. 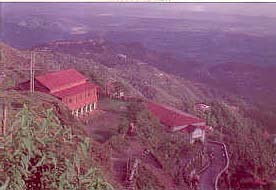 Upon returning, Bond set up base in the hills in north India. He chose the charming landscape of Dehra Dun to begin his career as a freelance writer. Here was someone, who only wanted to write, refused to be bound by the dreariness of a nine-to-five job, and who dared to eke out a living off freelance writing at a day and age when such a vocation was risky, bordering on eccentricity. Yet, he did it successfully through all these years—long hand and a rickety typewriter aiding him loyally. I’ve had this dread for the past five years, but somehow, just when the going gets really rough and my bank balance touches rock-bottom, something does in fact turn up…and if I can go on writing, not always in the way I want to—because, if cheques are to be received, deadlines and editorial preferences must be met—but pretty much as I want to. The books continued getting published, too. Vagrants in the Valley picked up from where The Room on the Roof trailed off. A series of short stories came along too, most of them marked by a stunning simplicity of language and an innate intimacy with nature. People often ask me why my style is so simple. It is, in fact, deceptively simple, for no two sentences are really alike. It is clarity that I am striving to attain, not simplicity…Of course some people want literature to be difficult. And there are writers who like to make their readers toil and sweat. They hope to be taken more seriously that way. I have always tried to achieve a prose that is easy and conversational. And those who think this is simple should try it for themselves. His novella, A Flight of Pigeons, set against the backdrop of the 1857 Sepoy Mutiny, the first Indian rebellion against the British Empire portrays human emotions and passions with a sensitive touch. Adapted for the silver screen as Junoon by acclaimed director Shyam Benegal, the book recounts the story of a young British woman whose father, a clerk working for the British authority in India, is killed in the Sepoy Mutiny. About half a dozen novels and novellas, hundreds of short stories and essays, and more than thirty children’s books later, Bond’s pen is far from retirement. Settled in the quiet charm of Landour, a hill station in the lap of Himalayas, he doesn’t have any dearth of story material. 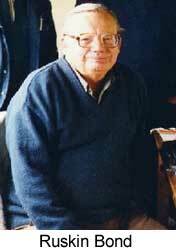 A lifelong bachelor, Ruskin Bond doesn’t live alone. He is surrounded by the mirth of his adopted family (he adopted a boy from the hills and has since graduated to become a proud foster grandfather). Indeed, he is more Indian than many of “pure” Indian descent can claim to be. Race did not make me an Indian. Religion did not make me an Indian. But history did. And in the long run, it’s history that counts. Ruskin Bond touches a cord in me the same way as Wordsworth and Tagore do. For, his heartwarming relationship with nature and the spectacular simplicity of his words never fail to remind me of the magnificent beauty a glistening dew drop or the song of a skylark hold. Wow. What a great post. I’m not sure I’ll be able to properly follow it. Ah.”people like literature to be difficult.”Big words do not make for big ideas, and simple ones can enclose a world.Thank you, Bhaswati. I was struck by the same line as Bernita was. I recently fell in with Tobias Wolff for that very same reason. He was deceptively simple. And being a computer programmer, I realize this is no accident. It is so much more difficult to keep it simple, but it is the mark of a professional that it is. Matt, you exaggerate. I love reading your posts–smart, snappy, informative.Many thanks for the kind words. :)Bernita, how I agree with Ruskin Bond there. Simplicity is easy to brush aside, yet possibly not that easy for a writer to attain. Scott, I agree, completely. I think if you write for a living, like Ruskin Bond does, simple but effective prose becomes imperative. Sounds like an intriguing author! You have amazingly full and researched posts, Bhaswati.Do you find there is a signature approach or theme to ghost stories from Indian authors when compared with British or North American? Thanks, Jason. The idea is to share as much as I can, about authors I enjoy reading. Regarding ghost stories, I am afraid, I am not too familiar with American spooky tales. In India, ghost stories make up (or at least did during my childhood) a fair share of the YA market. A lot of them were also written during the British Raj. Ruskin Bond has edited one such anthology called “Ghost Stories from the Raj.” Since India is geographically and socially diverse, a lot of ghost stories are peppered with regional folklore and local superstitions. Fun stuff to read. Interesting post. I am feeling the need to head down to the library – do you have a recommendation for which Bond book to start out with? Hi Peggy, thanks for dropping by. You could start with collected works of Ruskin Bond (Penguin has an edition called “The Best of Ruskin Bond”). This would include his short stories, essays, poetry, as well as sections from novels. 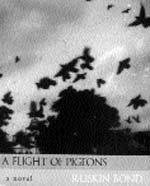 If history interests you, pick up A Flight of Pigeons. It’s a well-told story. Then there are ghost story anthologies like Ghost Stories from the Raj, A Season of Ghosts, and A Face in the dark and other hauntings. Ruskin Bond is ultimately a very graceful writer. I first read ‘A face in the Dark’ in school, and went on to read Room with a View during the summer school holidays and still later, after watching Benegal’s movie Junoon ‘A Flight of Pigeons’, and hence your writeup on Bond, stirs quite a few nostalgic moments, as, I am sure, it does for many others.And I agree with your point that he writes simply- and that is what his writings beautiful. BS, I read A Face in the Dark while in school, too! Chilling, no? It had such an eerie effect on me. Glad the post evoked some nostalgia for you. Thanks for the suggestions. I’ve put them on my “look for in the library” list. You are welcome, Peggy. If you can get your hands on a Bond book, do let me know how you like it. Very interesting information about Ruskin Bond, Bhaswati. I really enjoyed it and am looking forward to getting some of his works to read.Thanks for your comment on my blog too. What a beautiful thing to say. It really made my day. Thank you. Glad you liked it, Simran. Do let me know how you like Bond’s writing if you get to read him. And you are most welcome. Your post was beautiful and touching. The comment came naturally in response to your lovely words and emotions.